Description: "A professional set of tools for creating video for the Web, DVD, CD-ROM, and videotape". 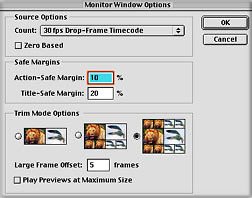 You will find the same familiar desktop, with the addition of separate playback controls for each of the monitor windows, a scrubbable clip thumbnail in the project window, a single track editing mode (don't worry, you still have the 2 track option as well), and categorized effects palettes. 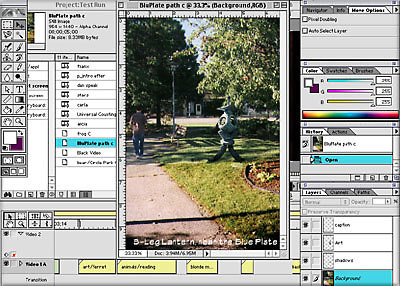 They have also incorporated the Photoshop 'History' palette, which I have closed in this shot, along with the Navigation, Commands, Effects Controls, and Info palettes. Premiere 6.0 is a huge leap over 5.1 in terms of stability, lack of dropped frames, and support for DV. 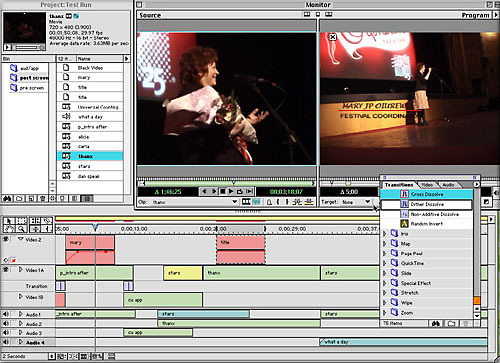 Premiere is now incorporating many of the features that sent FCP to the top as a software NLE. Premiere's developers have held tenaciously to its Adobe-style interface and strengthened the link between Adobe products. 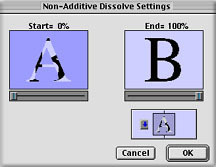 I'm not a heavy user of Adobe products (just a Monday Night Photoshopper, as it were), so I am not as comfortable with all the palettes and arrow menus and window settings as some users. But, if I were creating videos for GoLive web sites that incorporated Photoshop images, and/or Illustrator graphics, Premiere 6.0 would certainly have to be in the system. An Edit Original command on any Adobe-created image in a Premiere project opens the file in the source program, and any changes you make to the file are applied to the copy in the Premiere project. and automatic updating of the file in Premiere. 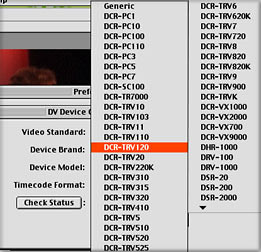 Support for DV and Firewire was an obvious necessity for this upgrade, and the DV Settings window, indeed, specifically names most of the cameras and decks available in DV format. But I'm skeptical: are specific equipment settings really useful? Are the settings really different, or is the long list just eye candy? If your device isn't listed, you can use 'Generic'...will it make a difference? This is a LONG list of supported devices, and it's just the Sony list. The developers have added a 'professional' single-track editing mode to the familiar A/B two track method.This is in direct response to FCP's easy intuitiveness. I have never thought this A/B track editing was easier, although the Premiere manual's advice is to use it if you are new to video editing. Three long-time Premiere users whom I consulted couldn't imagine doing it otherwise, and one gave up on Final Cut Pro because he thought it was 'too hard to learn'. I guess it all depends on what you are used to. I spent frustrating months struggling with Premiere 5.0, but picked up FCP instantly. I just do not find this checker boarding of clips to be intuitive. I got very hung up trying to add clips. By the way: can anybody tell me how to fade in at the beginning? I've been told variously, to put the clip on the Video 2 track and adjust the opacity rubberbands, or to create a black clip and do a cross dissolve. The manual doesn't say. I'm thankful that video tracks are black by default in FCP. 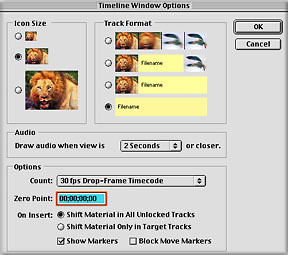 You can arrange your clip icons in a storyboard arrangement, and with one command drop them, in order, into the Timeline. Each of these clips has already had In and Out points set. 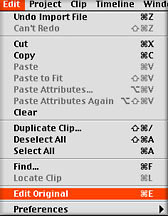 Multiple sub clips of the same larger clip can be added and dragged to any position in the storyboard. When you select the Automate to Timeline command, you get this dialog.box. There is always another dialog to respond to when you are trying to move ahead in Premiere! This is a swift and graphic way of creating a rough assembly of clips, but I was intrigued by the concept of automatically placing certain shots at specific markers in a music video. I was pleasantly surprised that it worked flawlessly. and occur at the downbeats in the music trk. 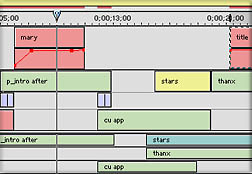 This feature uses the two track editing mode and alternates tracks for each shot. 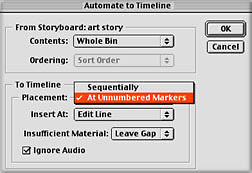 Unfortunately, it takes a 3-fingered keystroke to add the markers to the timeline. There is a lot of fuss made over the fact that Premiere now has a virtual audio mixer and FCP, even v. 2, still doesn't. While it is wonderfully satisfying to raise and lower volume or pan on a track in real time, the results are less than perfect, and one still has to adjust the rubberbands. The whole beauty of having a graphical representation of your tracks is that you can adjust the relative levels visually. Real-time is fun, but you've got to get those cues right, or do it again and again. 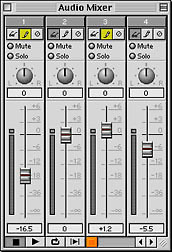 The Audio Mixer interface. Be careful that you are not in 'write' mode when you only want to 'read' a track! There is a 'Master' fader if you scroll over to the right. It is incomprehensible that you can have only one sequence per project. This leads to endless renaming and incrementing of projects, and no possibility to instantly judge one version with another. Navigating is awkward. Everything has its own window to open in, and/or a palette for making changes. Adjusting the endless number of settings and options for every window and every action, really cuts into actually moving forward with editing a project. there are just too many little settings, window options, arrow menus, palettes, choices; and they are all over the desktop. The settings viewer should give me a quick look at everything I've set. There are way too many choices for thumbnail size: why waste RAM on thumbnails? Good logging practices will give you a clip name that tells it all. The project you were working on yesterday does not open when you start up the program, and you have to go looking for it in the 'Recent Projects' menu. Titles have to be 'saved' somewhere, and named, and you have to import a representative frame to see what the title might look like over one frame only, of your clip. Every time you are prompted to 'save' something, you have to navigate somewhere: making your scratch disk prefs seems to have no impact. The project window takes up too much unproductive acreage, even in list view. You can't view the contents of all bins at once. What's the use of this big bin icon? What you have to wade through to change the length of a dissolve. I find the use of huge icons everywhere, and separate window dialogs, terribly frustrating and counterproductive. 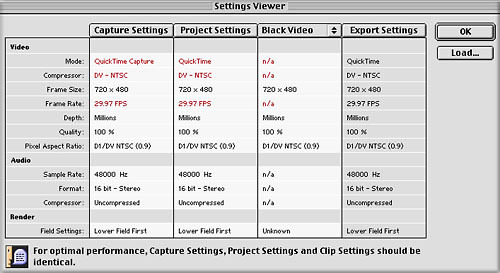 If you are in the market for a sturdy NLE in a moderate price range for independent video film making, you would do well to grab Premiere 6.0. If you have been editing with Premiere 5.1, you will love this upgrade. If you use Adobe software extensively, you should add P6 to your system. And if you want to edit video on a Windows platform, well, you really don't have much choice, do you? This article was originally published at 2-pop and is reprinted here with permission.